No need to manually lock your device with the top screen lock button. SpeedLock does it for you. Automatically. Easily. Configure your BlackBerry your way. Use a quick screen tap or automatically lock your screen when you set the backlight to shut off. You decide. Beautifully designed lock screen displays on top of your background image. Optimized for performance, SpeedLock won't drain your BlackBerry's power. SpeedLock integrates seamlessly. Download, install, done. And at this price you can't beat the convenience-cost equation. 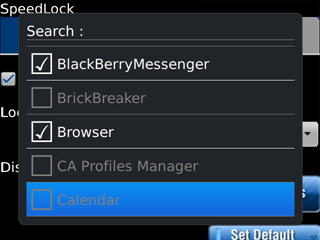 SpeedLock is available now in BlackBerry App World for just $0.99 and works on both touchscreen and non-touch devices. Grab it from the link below.